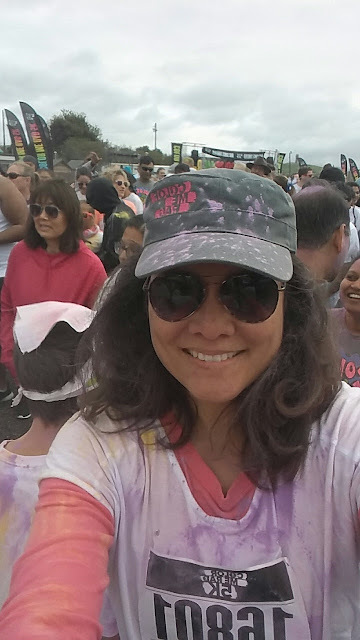 I've been wanting to go on a fun run with 3Po and Jammy for a while now, A color run -- fun runs inspired by the Indian celebration of Holi, where runners are showered in color -- seemed like the perfect way to start. With their crazy soccer schedule, however, it always seemed like they had a soccer game conflicting with a run I was interested in, so it took a long time before the stars finally aligned and we were able to find a free weekend that coincided with Color Me Rad in San Jose. To our delight, Alfie and The Pea decided to join us, so the run turned into a family affair. 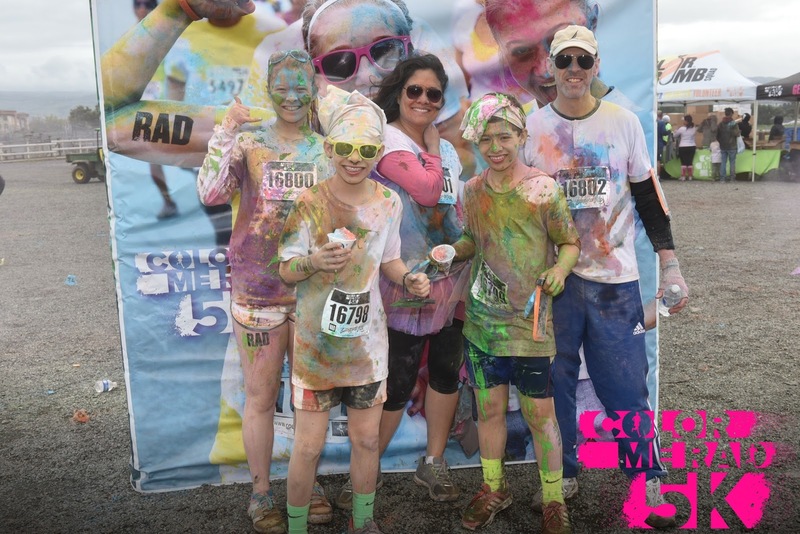 We had an amazing time (head over to Bonggamom Finds for a detailed description of the Color Me Rad race). 3Po and Jammy ran the 5k with hardly any effort whatsoever (probably not surprising since they're training 3 times per week on a competitive soccer team), and we ran at an easy pace. 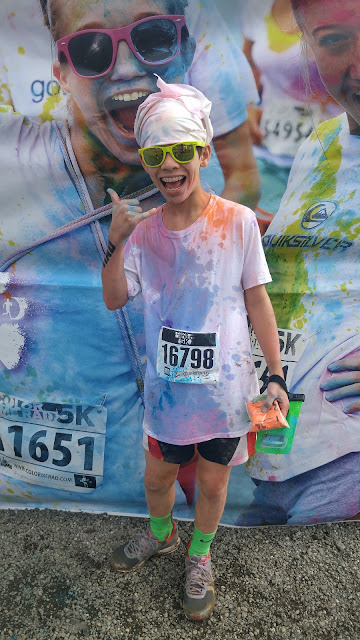 Volunteers plastered us with color at 4 stations along the way and at the finish line. To make things even messier, it had been raining every day for a week, so parts of the course turned into a "bonus" Mud Run! Many runners get annoyed when they're forced to slow down, so set your expectations of what this run is all about. This is not a race where you're likely to achieve a personal record. There will be lots of walkers and lots of kids, so be prepared to dodge a lot of slow-goers and even a stroller or two. The operative word is "fun", so focus on enjoying the moment and getting covered in color! Color shows up better on a white tshirt! Wear a white tshirt that you don't care about, because the color may not wash off completely. The shirts may not come out of the wash completely white; they might end up stained a very light pink or orange. For some reason, the free tshirt included in the Color Me Rad registration packet was grey, not white, so we decided to bring the grey shirts and keep them in the car, to change into after the race. Alfie, The Pea, and I wore old white shirts we no longer cared about, and for the boys, I bought a 4-pack of Hanes white tees at HomeGoods for just $5! A friend taught me this trick a long time ago -- if you don't want to wear a long-sleeved jacked to your race but are concerned about feeling cold at the beginning, wear a garbage bag to stay warm! Tear out neck and arm holes, and wear it like a t-shirt. Once you start feeling warm, you can tear the garbage bag off and stuff it in the nearest trash can! None of us wanted colored powder in our eyes, so we all wore cheap plastic shades while running. 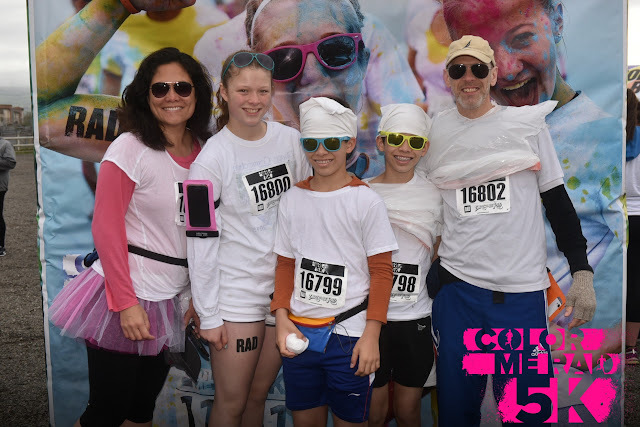 Color Me Rad sells plastic sunglasses at packet pick-up and on race day. They cost just $5, so it's worth buying a pair and sparing your nice designer shades from getting doused in dye. Unlike sunglasses, I think caps are entirely optional, but worth mentioning. Whether you want to wear a cap or not depends on whether you're okay with getting your hair covered in color. The Pea wanted her hair colored, so she didn't wear a cap. I've read reports of people with light hair having more trouble washing the color out of their hair, but The Pea (who is blond) didn't have that problem. 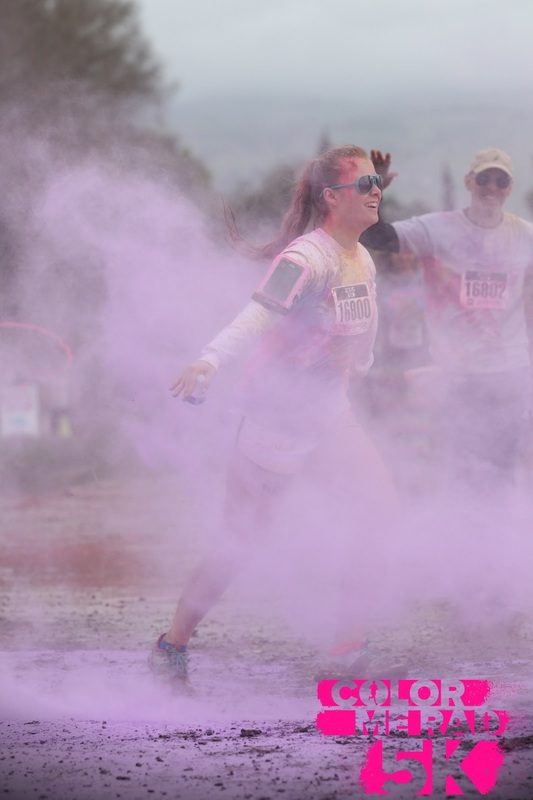 The dyed cornstarch powder used to coat the participants in color is non-toxic, and it's supposed to be safe when inhaled in small amounts -- but when you're running and gasping for air, the last thing you want is to breathe in a whole lot of powder! Many people bring bandanas and pull them up over their mouths and noses as they run or walk through the color stations. If you don't have a bandana, try holding your breath as you run or walk through the color stations. 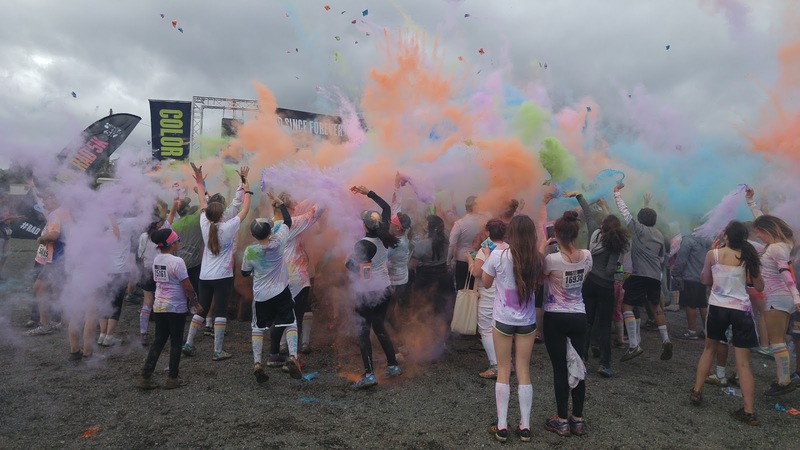 After the run, you are sure to be covered in color, both powder and liquid. 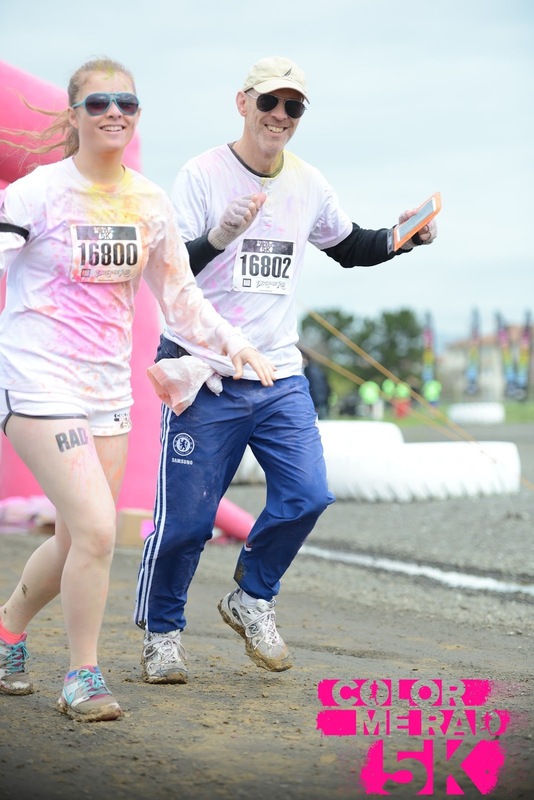 We had color literally running down our faces, necks, arms, legs, and clothing. You're going to want to wipe at least some of that color off before you get into your car! The race venues will probably have hand washing stations near the porta-potty area, or maybe even actual restrooms, but in case you don't have access to a lot of running water and paper towels, it's a good idea to have a large pack of baby wipes in the car. 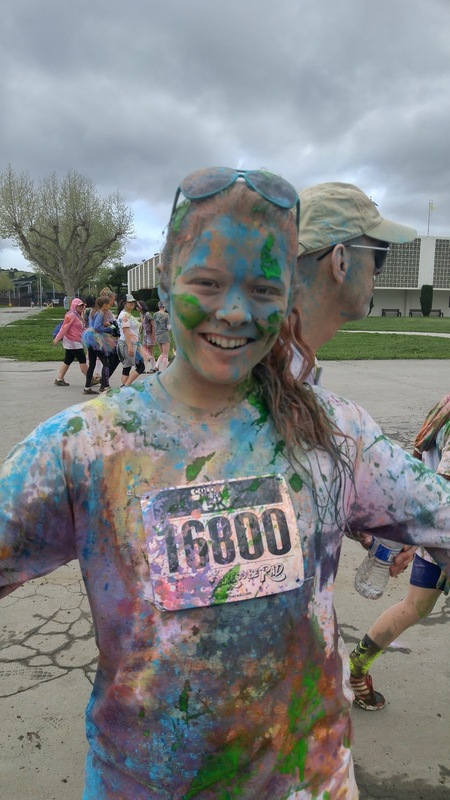 After the run, your shirt is sure to be saturated in wet, slimy, or powdery color. If it's a cold day, the last thing you want is to drive home feeling cold and clammy, so don't forget to have an extra shirt on hand in the car. There's nothing like changing into a clean, dry shirt! You'll need a bag to dump all the layers that you peel off! You can pack an extra garbage bag in your car, or even better, pack a reusable cloth bag -- you can throw the bag into your washing machine along with all your other stained clothes. 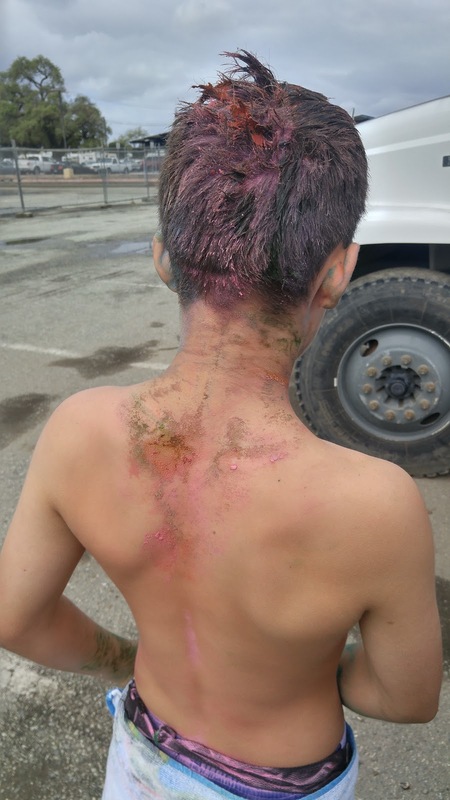 Even after peeling off your tshirts and jackets and caps, even after you've wiped off your face and your hands, there's still a good chance that parts of your body will be stained with color -- I'm talking shoes, socks, legs, arms, hair, neck, shorts, pants, etc.. Bring 1 towel for each person to sit on for the ride home, so the color doesn't stain your car seats!